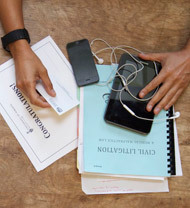 The Faculty of Law's Financial Aid Program requires a student to apply for and to qualify for government financial aid, and to have a satisfactory credit rating. If you anticipate problems with these requirements, you are urged to contact the Financial Aid Office as soon as you receive an offer of admission. IMPORTANT: Before submitting the government student financial aid (loan) application form - online or on paper - you MUST retain a copy of that completed form, showing the form questions and your data entered. The copy of the completed government student loan form is needed for the JD Financial Aid application. Indigenous/Aboriginal students may also be eligible for financial assistance from the federal department of Justice Canada, the federal department of Indigenous and and Northern Affairs Canada, or the student’s home band administration office. Please contact the Faculty’s Financial Aid Office at financialaid.law@utoronto.ca for further details.